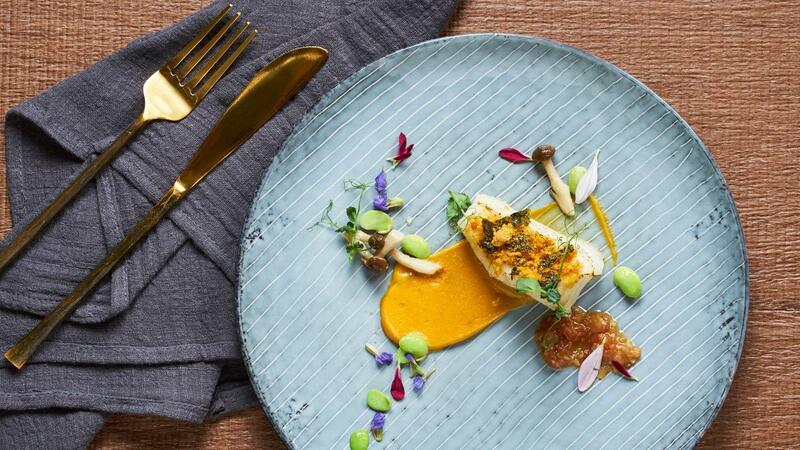 This yummy dish boasts baked cod encrusted with salted egg yolk and chicken floss, served piping hot on a bed of mushroom and edamame ragout, and ginger tomato sauce. Add in sugar and chicken powder and allow to dissolve. Slowly add in evaporated milk and heat till it bubbles. Add in salted egg yolk powder, lower heat and stir till it turns golden brown. Mix chicken floss and curry powder together. Stir fry mushroom till fragrant and add in edamame beans. Add in seasoning, Cream and lemon juice. Heat olive oil and sauté garlic, onion and ginger until soft. Add tomato, fish sauce and sugar. Simmer for 10 mins and season to taste. Baked cod fish in preheated oven at 180 degrees for 7 mins. Coat prepared salted egg yolk sauce and topped with chicken floss. Sit prepared fish on a bed of mushroom and edamame ragout and serve with ginger tomato sauce. Garnish with prepared curry leaves and edible flower.